ABOVE: You are looking at the second floor of the Cross House, the southeast corner. Sorry for the dark blue patch, that is on the drawing I have. The bedroom was, it seems, the housekeeper’s room. The door shown is right off the servant’s stair, although the door was actually placed a bit over to the west (left). Then there was a blanket closet with drawers. The why of this post is the windows. You see one at the bottom of the drawing, and it indicates two 30×30 sashes. There is another window to the east (right), and almost hidden by the blue rectangle. But, the windows today are not 30×30. 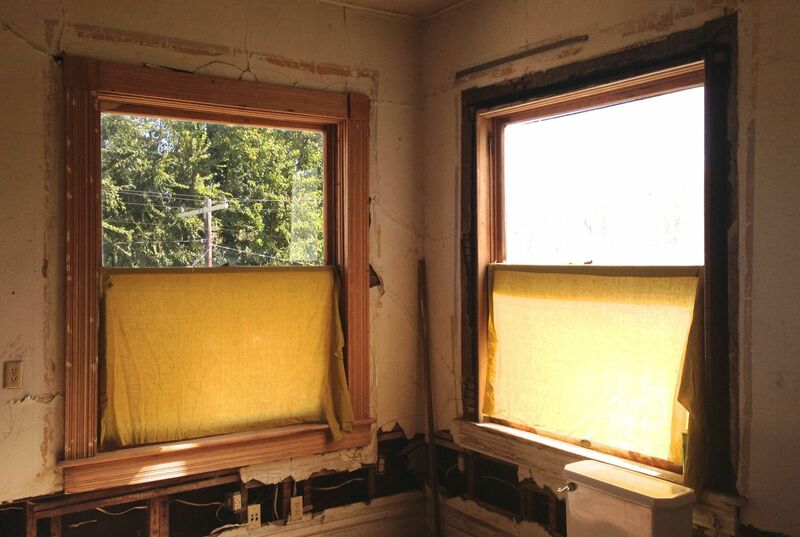 They are MUCH larger, I mean just HUGE, with each window having two 51-wide x 33-high sashes. All evidence points to the huge windows being original. No one has been able to offer an answer, and we all depart the room with stumped expressions. A week ago a thought occurred to me: Ah-ha! I might know the why of the why! 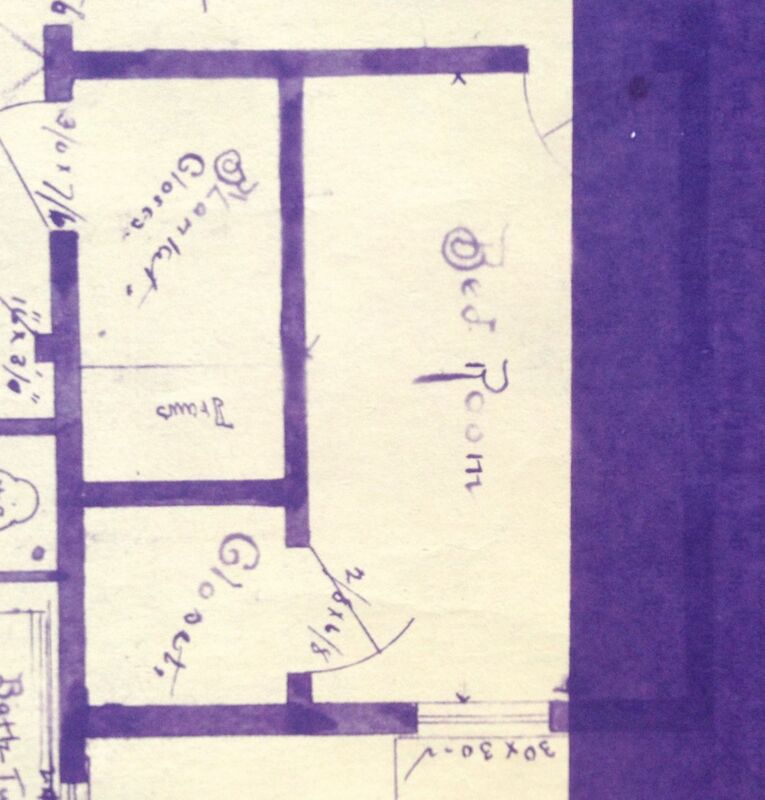 ABOVE: You are looking at an original blueprint of the Cross House, partial south facade. See the window on the second floor? That it what the architect intended. It was a good-sized window, and comparable in scale to all the other windows. But that is not what was actually installed, which was almost twice as wide. 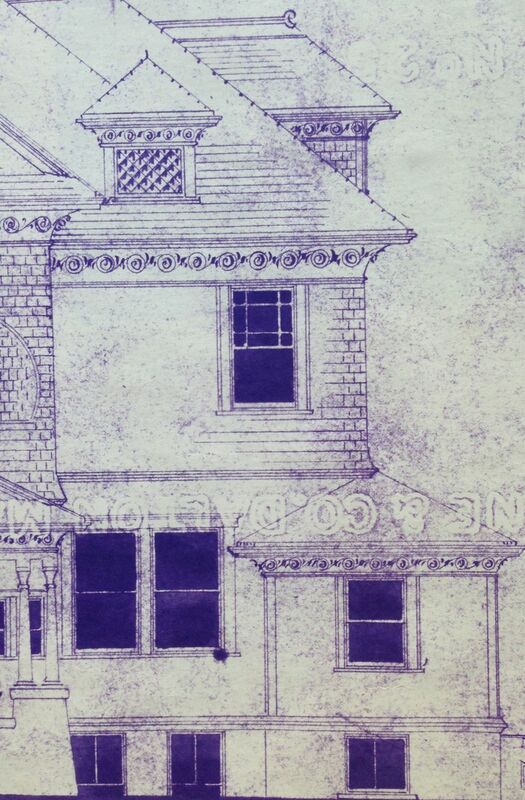 NOTE: The dormer, above the window and just to the left, was never built. ABOVE: The windows in question. In the image one cannot appreciate their considerable size. But, I can assure you, this is instantly evident in person. Oh, and yes, the room is a wreck. In fact, all the rooms of the Cross House look like this. Some are much worse. But missing plaster does not overwhelm me, although missing trim would. Luckily the missing trim in the images is in the basement. Praise the Lord. THE PLAYERS: Mrs. Susan Cross (owner) and Mr. Charles W. Squires (architect). Mr. Squires smiles pleasantly at Mrs. Cross. Mrs. Cross got her windows. And a much chagrined housekeeper was kicked upstairs to the expansive third-flloor attic. While I have no proof as to this exchange, I am certain — certain! — that this is what happened. The room, indeed, would have made a wonderful conservatory. Such rooms were all the rage in the 1890s, and it was common for Very Large Houses to have a conservatory. Ok, I might be wrong about all the above. Perhaps Mr. Squires had two huge windows left over from another job, and slipped them into the housekeeper’s room. We will likely never know the why of the why. Anyway, I really love my very small room with the very large windows. I often look at the windows, smile, and think: What is your story? 14 Responses to …and did Mrs. Cross belatedly need a conservatory? If not a conservatory, my guess is that since a maid’s duties included mending clothes and such, the good light would have helped her be more efficient. In my house, most of the early oddities were from the addition of the kitchen wing (they moved and reused windows and such), did the Cross house have any additions/changes that would have had them moving elements around like that? The Cross House, by some miracle, has never had any additions. And while I can appreciate the value of good light for sewing, I have never, ever, seen a housekeeper’s room with such HUGE windows. That said, I cannot say that you are NOT right! I just do not know the why of the big big windows. Yet another old house mystery! You mention that this room is in close proximity to both a closet and a blanket closet. I’m wondering if it could have been a winter drying room? Any evidence that wooden racks were hung from the ceiling with pulleys? Just a thought! Any winter drying would have taken place in the HUGE open-floor top level. The entire top floor of the house is one massive room. Pretty amazing! And ideal for drying clothes and sheets in 1894! I believe you are correct about the windows, but she may have them there because she had (a new term) light deprivation. If I were in Kansas during dark months of winter I would love to sit among my plants reading. You would not have need of a great cook would you? Kansas has pretty mild winters. And more filled with light than dark. I do not NEED a great cook but would LOVE one. Love, love, love reading every detail of the Cross House restoration. By the way, I also love that your name Ross is built-in to the Cross name…so perfect! I binge-read for days, studying every picture and every blue print. Couldn’t get enough. Now, I’m sure I resemble all expectant fathers of the 1950’s (except I’m female) pacing the room, but I’m awaiting each new entry. So to fill by greed, I am re-reading! Just wondering if there are any water stains on the wood floors in this room which might confirm the idea of it possibly being a conservatory. I’m thinking that no matter how careful one is, that would surely have happened and probably more than once. Thank you so much for saving this glorious house and letting us all come along for the ride! All the floors in the house are circa-1950, so any 1890s stains are long gone! Oh, that’s right, forgot that part! So much for my idea! I’ve been enjoying your blog for a couple of months now, and actually binge read it to start. And I don’t think it likely a conservatories access would be from the servant stairs… A real mystery! Funnily enough, the house I’m talking about was built in 1895, and has a lot of the same features as the Cross House! Ross my dear? How close to the kitchen is this particular space? And are there holes drilled in the casement as I seem to see? My first thought was/is, given the light in the windows, this was the “kitchen herb garden”. My grandmother ALWAYS had some sort of plant in the kitchen window, even if it was just geraniums or Jacob’s coat. Most often, there were jars of water with sweet potato vines and other vegetable ends. So it would not be unusual to see such glorious light put to use for “wintering over” certain popular herbs when the weather was bad. Check and see if there would be a couple of trayed grills that fit those windows in your hoard of “whatsis” in the basement.